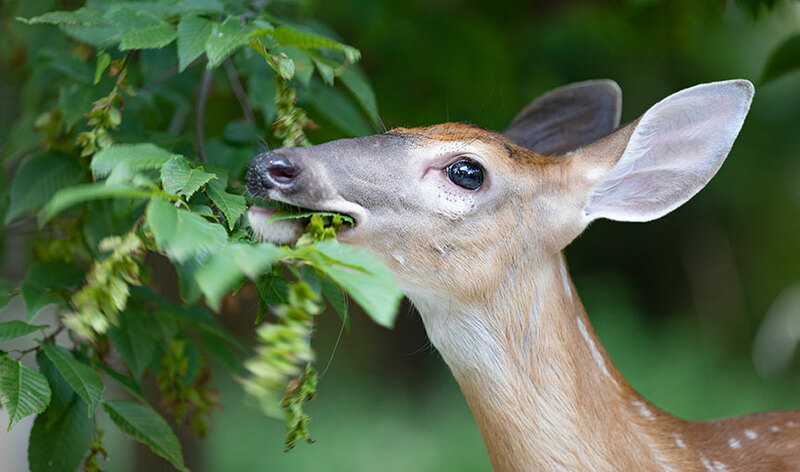 Nursery owners try many methods to stop hungry deer from munching their crops. One of the most destructive nursery pests isn’t a beetle or mite. It’s much larger and though often overlooked, capable of a tremendous amount of damage. We’re talking, of course, about deer. Dave Tankard, Jr. and Van Tankard, are the current owners and operators of David’s Nursery. The Exmore, Va. operation is based on the Eastern Shore of Virginia, and grows acres and acres of boxwood, hosta and other shrubs. Van handles all the spraying, and has a constant battle with scale insects, but the nursery’s biggest pest is deer. “It used to be they were an annoyance, they’d eat a few plants on the edge of a crop,” Dave says. “But they’ve been getting worse and worse. ”The nursery has a natural shade area where it grows it’s hostas, a shrub well-known to be a deer delicacy. The Tankard brothers protected the area, but it wasn’t enough. “We had a little electric fence and it used to be enough to keep them out, but lately they’ve been going right through that,” Dave says. To continue the fight against the marauding deer, David’s Nursery installed a deer fence. So far, the results have been good. There are two gates, so vehicles can still use the road going in and out of the shaded growing area. Dave plans to fence off more of the nursery as needed and as they get time. Many nurseries allow hunting on the premises from time to time. A few employees thinning the deer population can work wonders, assuming all permits are in order. But that isn’t an option for every nursery. Willow Springs Tree Farm is a wholesale landscape material nursery in Radford, Va. It grows conifers, hardwoods, and shrubs. The nursery is surrounded by a considerable amount of farmland and woodland. It is also located 1/3 of a mile from a 1,000+ acre military installation where hunting is prohibited. “It goes without saying that the deer population is out of control,” says Skip Kuchenbuch, Willow Springs’ farm manager. He says deer browsing on yews (Taxus), burning bush (Euonymus), dogwood, and Fraser fir is the biggest problem the nursery has experienced. Skip and his crew tried everything from damage hunting permits to five other types of spray deterrents but found nothing that works as well as Plantskydd. Plantskydd is an all-natural deer repellent that lasts up to 3-4 months during the growing season, and up to six months over winter. It repels by scent; yet it has a non-offensive odor to people. The active ingredient is dried blood meal, recognized by the EPA as environmentally safe. It is OMRI-listed as an organic solution. Plantskydd was developed for commercial forest planting in Sweden, but is now produced in the U.S.
With the use of Plantskydd, Skip says Willow Springs has basically eliminated the problem. When used on hardwoods, he notes that it also seems to aid in reducing horning by bucks during rutting season.